Since 1980, when Premier Neville Wran demolished the entrance turnstiles, admission to the Art Gallery of New South Wales has been free to all comers. The director he appointed, Edmund Capon, made it an article of faith throughout the 33 years of his tenure to ensure that it remained free. Occasional attempts by Treasury and Governments to put the issue back on the table were firmly rebuffed, with the support of the entire Gallery community. When I interviewed volunteers for my 2013 book Art Lovers on the history of the Art Gallery Society (the membership organisation), maintaining free access was the main reason most of them gave for their invaluable service. It’s disquieting, then, to learn from some members that if the grand Sydney Modern extension is built, entry fees may be reintroduced to help cover the huge increase in running costs. 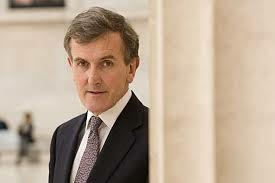 One longstanding member considers the move “inevitable”. If that’s the price of the new building, it’s way too high. 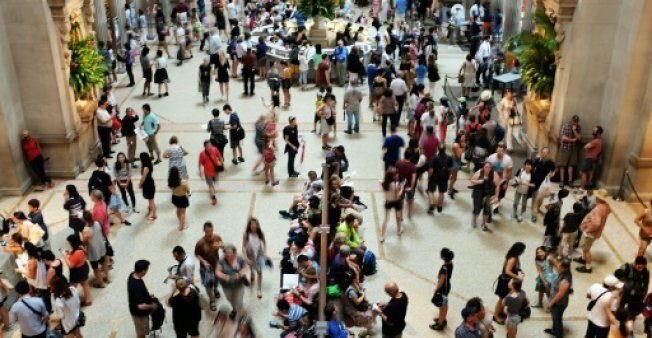 While it’s universally accepted that visitors pay for entrance to special temporary exhibitions or “blockbusters”, the collections of cultural institutions must remain accessible at all times to the people, to whom they belong. 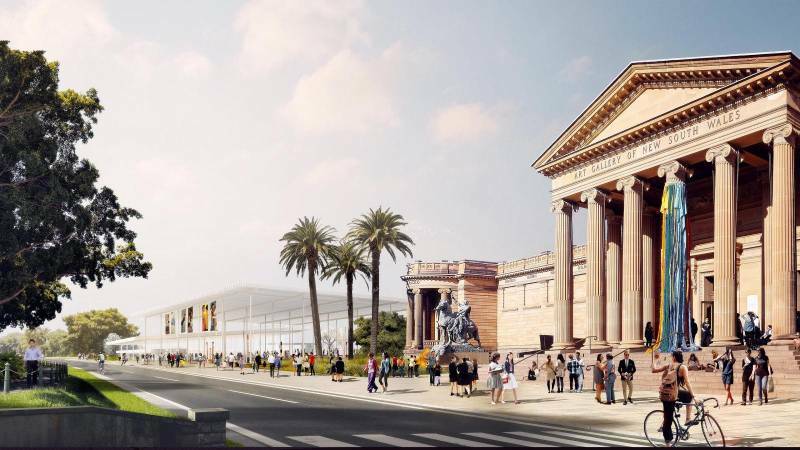 There’s an argument that the Sydney Modern building (pictured digitally above, to the left of the existing gallery) will attract millions of overseas and interstate visitors who will be prepared to pay for admission. Not only does that ignore the rights of citizens; it ignores the experience of institutions elsewhere with far greater collections, and therefore greater powers of attraction, than any Australian museum. In London the National Gallery, both buildings of the Tate, the British Library and the British Museum are all free now, but it wasn’t always so. Charges for key national museums were introduced by the Thatcher government of 1979-1990. It was a deeply unpopular move, and had poor outcomes for the institutions: in some cases visitor numbers fell by a third. When Labour removed entry fees in 2001, those key institutions saw visitor numbers rise from 7.2 million to more than 18 million in a decade. The extra spend by high numbers of visitors, in cafes, restaurants and shops as well as for ticketed exhibitions, helps subsidise government funding. It’s not only the UK that has free entry. Even in the United States, epicentre of neoliberalism, the National Gallery in Washington and the Smithsonian have free admission, as do the Brooklyn and Bronx museums in New York. The same is the case at the Prado in Madrid and Japan’s National Art Centre in Tokyo. In the UK Prime Minister Theresa May’s government, desperate to restrict arts spending, doesn’t dare reintroduce entry fees after the failed Thatcherite experiment. Instead it commissioned a review which has now reported, concluding that there should be a halt to new museum projects so that the existing ones can survive. The review found that following the building boom since the turn of the century, institutions across the country are struggling to survive. Among them are the Royal Museums at Greenwich, which count among the top 10 London attractions. The cash-strapped museum complex in November stopped paying break times for its attendants who are on a measly £15,000 a year. Making your staff unhappy is hardly likely to enhance the “visitor experience”. Back in NSW, one of the biggest issues concerning Sydney Modern is how the increase in running costs will be paid for, given that the Coalition Government has made no commitment to increasing recurrent funding; rather, it’s cutting the AGNSW budget by 1.5% per year, the extent of the misnamed “efficiency dividend” that applies statewide. Great secrecy has long surrounded the business case for the expansion that the AGNSW prepared two years ago, with the help of expensive consultants, for submission to government. It should be published immediately. If the rumours about entry fees are unfounded, there’s no better way to scotch them. The next State election in NSW is a little over a year away, scheduled for March 2019. All parties contesting it should be obliged to commit to free entry to state-funded cultural institutions, including those like the Powerhouse and the Australian Museum which currently charge fees. So far both major parties have signally failed to develop a serious arts policy. This could be a start. The entry fee’s proponents are fond of asserting that “times have changed” since Edmund Capon’s day, and that governments can no longer afford for cultural institutions to allow the public in without charge. But Premier Gladys Berejiklian’s Government claims a budget surplus of $5.7 billion. What is it for, if not for the people? Adequate funding, with an end to the dreaded efficiency dividend, would be a relatively small cost compared to the many millions this government spends on consultants and infrastructure cost overruns. But it would be a shot in the arm for museums and galleries, and a major contribution to the cultural and social health of the State. Over the holiday period, in case you hadn’t noticed, the NSW Government has released a new online survey on cultural infrastructure . Members of the public have until 11 February to take part, and the Powerhouse Museum Alliance is among organisations urging supporters to have their say. More on this, and on the Sydney Modern consultation process, next time. Under Edmund Capon’s three-decade+ directorship the AGNSW became one of the most active publishing centres in Australia, from postcards and brochures to definitive scholarly texts on international and Australian art, spanning ancient world cultures to contemporary practice. Such activity was not merely a result of reliance upon travelling exhibition packages from outside the Gallery: much was initiated through original research by the Gallery’s professional staff and Capon himself under his tenure. This was paralleled by incredibly successful lecture courses administered by the Art Gallery Society. Everything worked in tandem, and paid for itself. Yet there was also a certain dignity in preferring not to partake any of the above, knowing that one was free simply to embrace the ineffable pleasures of the collections that belonged to the people. Free, for private meditation. And as the Capon era proved, a museum entry charge was not absolutely vital to balancing the annual budget. As long as the intellectual rigour and emotional élan of the Gallery’s programs were in balance, the expenses were taken care of by a sheer seductive zeitgeist of success, albeit sometimes born of chaos. The Gallery was free, and free-spirited, but the true believers who could afford it were beckoned to pay what was necessary to feel related to an inner culture of core purpose. It was an ethos that worked, but needed to be worked upon with intelligence. Sadly, a museum entry charge may prove to be far more detrimental than imagined by mere bureaucrats and bean counters. Very good points, Terry. On the business plan – there IS one, but it’s being kept secret. We need to see it!